Originally published on May 13, 2013 for Ethnography Matters, I’m republishing the post for the launch of the new Ethnography Matters Medium channel. I’ve updated the article with a case study from my time at Nokia where I witnessed their over-dependence on quantitative data. I’m continuously blown away by how much my original post in 2013 sparked a discussion about the integration of Thick Data and Big Data. Since then, I have talked about this topic with EPIC conference, Republica and Strata. I also gave a TED talk targeted for business leaders. Just last year, Word Spy created an entry of Thick Data, referencing my original post as the resurgence of the term. My goal is to create more opportunities to feature people who are doing this kind of integrative work inside organizations. Please reach out if this kind of work is up your alley. You can start by joining a community of people who are at the forefront of this work at Ethnography Hangout Slack’s #datatalk channel. Thank you to IDEO’s Elyssa He for translating this article into Chinese, 大数据离不开 “厚数据”, published on 36kr and Paz Bernaldo for translating this into Spanish. When I was researching at Nokia in 2009, which at the time was the world’s largest cellphone company in emerging, I discovered something that I believed challenged their entire business model. After years of conducting ethnographic work in China from living with migrants to working as a street vendor and living in internet cafés, I saw lots of indicators that led me to conclude that low-income consumers were ready to pay for more expensive smartphones. I concluded that Nokia needed to replace their current product development strategy from making expensive smartphones for elite users to affordable smartphones for low-income users. I reported my findings and recommendations to headquarters. But Nokia did not know what to do with my findings. 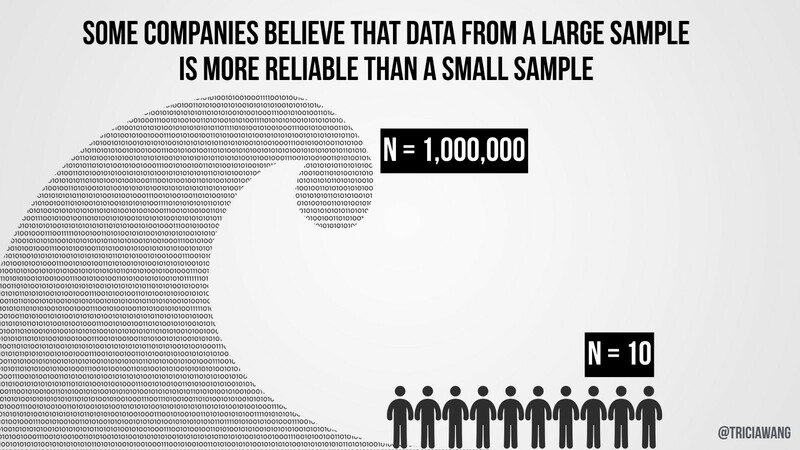 They said my sample size of 100 was weak and small compared to their sample size of several million data points. In addition, they said that there weren’t any signs of my insights in their existing datasets. In response, I told them that it made sense that they haven’t seen any of my data show up in their quantitative datasets because their notion of demand was a fixed quantitative model that didn’t map to how demand worked as a cultural model in China. What is measurable isn’t the same as what is valuable. By now, we all know what happened to Nokia. Microsoft bought them in 2013 and it only has three percent of the global smartphone market. 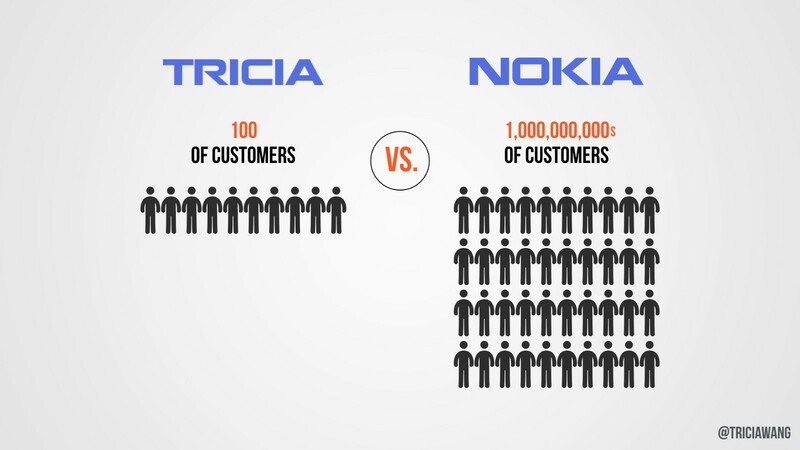 There are many reasons for Nokia’s downfall, but one of the biggest reasons that I witnessed in person was that the company over-relied on numbers. They put a higher value on quantitative data, they didn’t know how to handle data that wasn’t easily measurable, and that didn’t show up in existing reports. What could’ve been their competitive intelligence ended up being their eventual downfall. Since my time at Nokia, I’ve been very perplexed by why organizations value quantitative more than qualitative data. With the rise of Big Data, I’ve seen this process intensify with organizations investing in more big data technology while decreasing budgets for human-centered research. I’m deeply concerned about the future of qualitative, ethnographic work in the Era of Big Data. Ethnographic work has a serious perception problem in a data-driven world. While I’ve always integrated statistical analysis into my qualitative work in academia, I encountered a lot of doubt on the value of ethnographically derived data when I started working primarily with corporations. I started to hear echoes of what Nokia leadership said about my small dataset, that ethnographic data is “small” “petite” “puny.”. What are ethnographers to do when our research is seen as insignificant or invaluable? How can our kind of research be seen as an equally important to algorithmically processed data? To solve this perception problem, ethnographers need a 10 second elevator pitch to a room of data scientists. Lacking the conceptual words to quickly position the value of ethnographic work in the context of Big Data, I have begun, over the last year, to employ the term Thick Data (with a nod to Clifford Geertz!) to advocate for integrative approaches to research. Thick Data is data brought to light using qualitative, ethnographic research methods that uncover people’s emotions, stories, and models of their world. It’s the sticky stuff that’s difficult to quantify. It comes to us in the form of a small sample size and in return we get an incredible depth of meanings and stories. Thick Data is the opposite of Big Data, which is quantitative data at a large scale that involves new technologies around capturing, storing, and analyzing. For Big Data to be analyzable, it must use normalizing, standardizing, defining, clustering, all processes that strips the the data set of context, meaning, and stories. Thick Data can rescue Big Data from the context-loss that comes with the processes of making it usable. 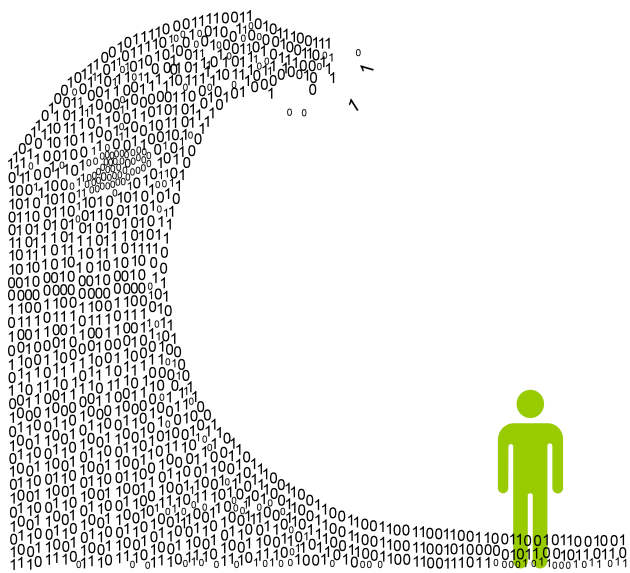 Integrating big data and thick data provides organizations a more complete complete context of any given situation. For businesses to form a complete picture, they need both big and thick data because each of them produce different types of insights at varying scales and depths. Big Data requires a humongous N to uncover patterns at a large scale while Thick Data requires a small N to see human-centered patterns in depth. 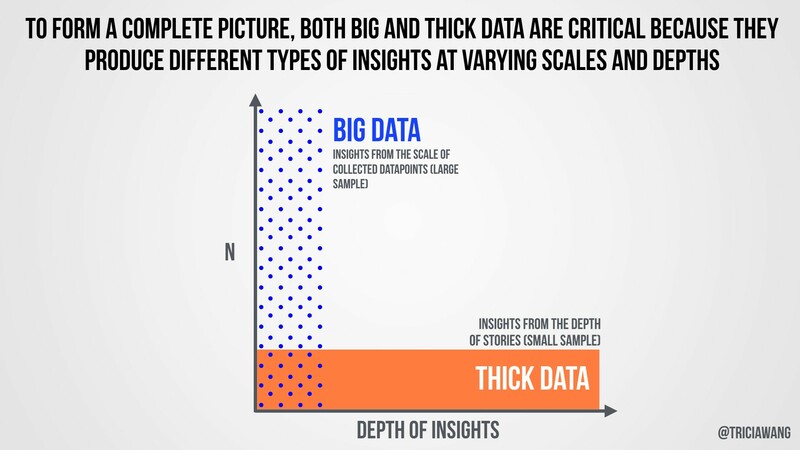 Both types of Thick Data relies on human learning, while Big Data relies on machine learning. Thick Data reveals the social context of connections between data points while Big Data reveals insights with a particular range of quantified data points. Thick Data techniques accepts irreducible complexity, while Big Data techniques isolates variables to identify patterns. 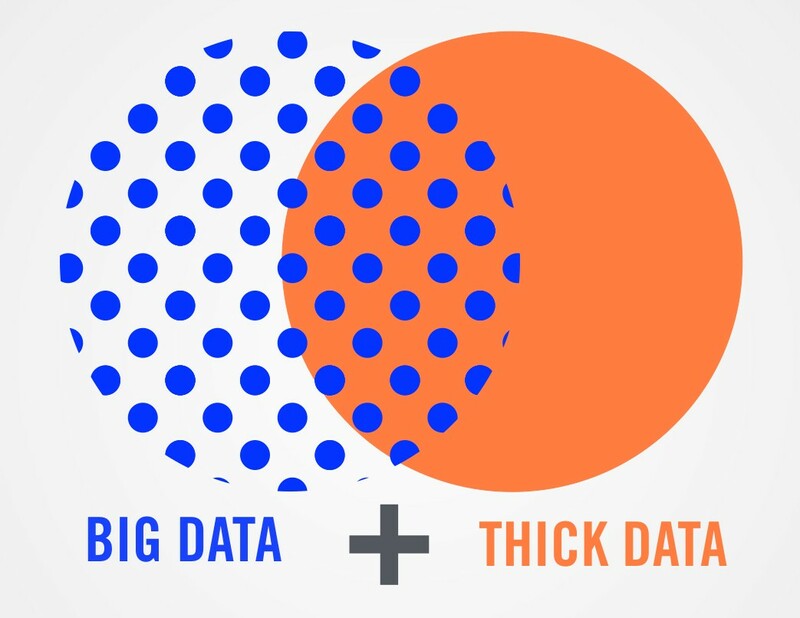 Thick Data loses scale while Big Data loses resolution. As the concept of “Big Data” has become mainstream, many practitioners and experts have cautioned organizations to adopt Big Data in a balanced way. Many qualitative researchers from Genevieve Bell to Kate Crawford and danah boyd have written essays on the limitations of Big Data from the perspective of Big Data as a person, algorithmic illusion, data fundamentalism, and privacy concerns respectively. Journalists have also added to the conversation. Caribou Honig defends small data, Gary Marcus cautions about the limitations of inferring correlations, Samuel Arbesman calls for us to move on to long data. Jenna Burrell has produced a guide for ethnographers to understand big data. Big Data produces so much information that it needs something more to bridge and/or reveal knowledge gaps. 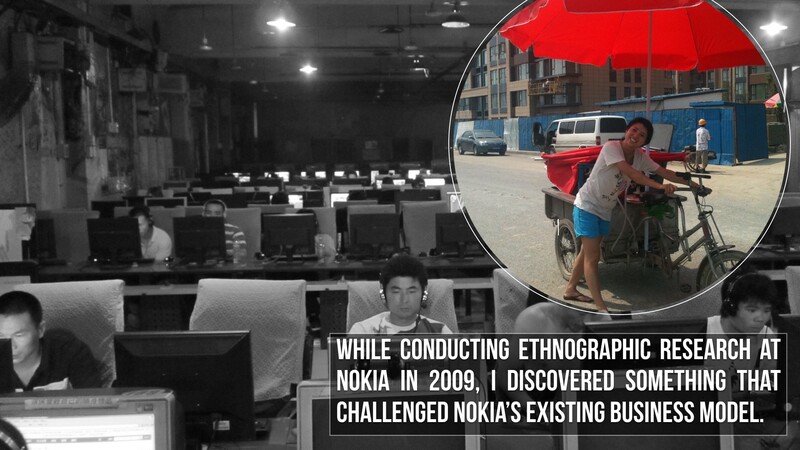 That’s why ethnographic work holds such enormous value in the era of Big Data. Below, I explore some the ways that organizations are integrating Thick Data. Thick Data is the best method for mapping unknown territory. When organizations want to know what they do not already know, they need Thick Data because it gives something that Big Data explicitly does not — inspiration. 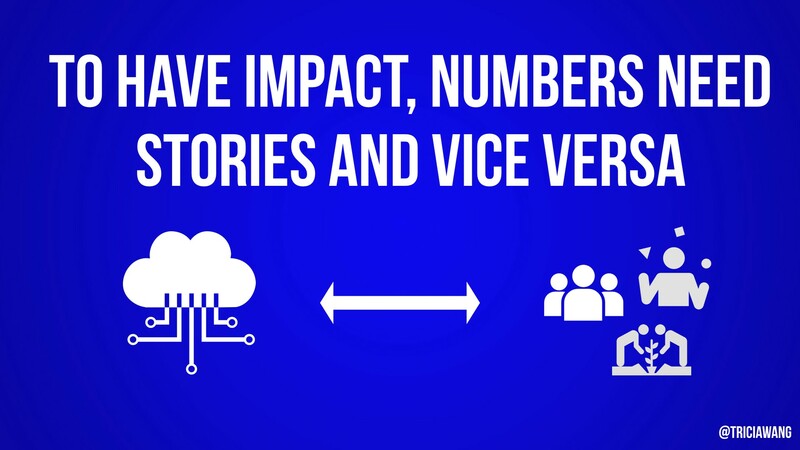 The act of collecting and analyzing stories produces insights. Stories can inspire organizations to figure out different ways to get to the destination — the insight. If you were going to drive, Thick Data is going to inspire you to teleport. Thick Data often reveals the unexpected. It will frustrate. It will surprise. But no matter what, it will inspire. Innovation needs to be in the company of imagination. NPR has a segment that illustrates the power of Thick Data, featuring Frans de Waal, a primatologist and biologist who just published “The Bonobo and the Atheist: In Search of Humanism Among the Primates”. Through his experiments, de Waal provides evidence to support his theory that a sense of fairness — the groundwork for morality — is not unique to humans. In his talks, de Waal shows a video of two Capuchin monkeys receiving different rewards for performing the same action. The monkey that gets a cucumber becomes very upset when she sees the monkey next to her given a grape as a reward for performing a similar task. In the monkey world, grapes are crack and cucumbers are stale bread. Here are some areas where I see opportunity for collaboration between the two methods within organizations (this is not meant to an exhaustive or comprehensive list). Health Care — As individuals have become more empowered to monitor their own health, Quantified Self values are going mainstream. Health providers will have increased access to collectively sourced, anonymized data. Projects such as Asthma Files provide a glimpse into the future of Thick and Big Data partnerships to solve global health problems. Repurposed anonymized data from mobile operators — Mobile companies around the world are starting to repackage and sell their customer data. Marketers are not the only buyers. City planners who want better location-based data to understand transportation are using Air Sage’s cellular network data. To protect user privacy, the data is either anonymized or deliberately scrubbed of personal communication. And yet in the absence of key personal details, the data loses key contextual information. Without Thick Data, it will be difficult for organizations to understand the personal and social context of data that has been scrubbed of personal information. Brand Strategy and Generating Insight — Companies have long relied on market analysis to dictate corporate strategy and insight generation. They are now turning to a more user-centered approach that relies on Thick Data. Fast Company’s recent feature of Jcrew makes clear that where Big Data driven management consultants failed, the heroes that led a brand’s turnaround were employees who understood what consumers wanted. One employee, Jenna Lyons was given the opportunity to implement iterative, experimental, and real-time testing of products with consumers. Her approach resonated with consumers, transforming Jcrew into a cult brand and tripling its revenues. The integration of Thick Data raises new questions for organizations. How do we train teams in integrative Big Data and Thick Data approaches? There is greater demand for ethnographers as suppliers/providers than as employees inside organizations. There are not enough ethnographers working inside companies to internalize ethnographic research and to explore different ways to extend the insights of Big and Thick Data. Even though we have a lot of questions to answer about Thick Data, it’s important to keep in mind that this is the time for ethnographic work to really shine. We’re in a great position to show the value-add we bring to a mixed-method project. Producing “thick descriptions” (a term used by Clifford Geertz to describe ethnographic methodology) of a social context compliments Big Data findings. People and organizations pioneering Big Data and Thick Data projects, such as Fabien Giradin from the Near Future Laboratory or Wendy Hsu, are giving us glimpses into this world. It’s also important to remember that there is a lot of progress to be made on Big Data. According to a Gartner study of companies who had invested in Big Data capabilities, only 8% of were doing anything significant with their Big Data. The rest were only using Big Data for incremental advances. This means that a lot of companies are talking and investing in Big Data, but they aren’t doing anything transformational with it. For enterprise and institutions to realize the full potential of Big Data, I believe they they need Thick Data. And that is why ethnographers are more needed now than ever. We play a critical role in keeping organizations human-centered in the era of Big Data. Since writing this updated article in 2015, I gave a talk at TEDx with a business audience in mind for why every organization needs to prioritize Thick Data and the integration of it with Big Data. If you’re struggling to get alignment for the importance for Thick Data, share this video with your leadership and management teams. 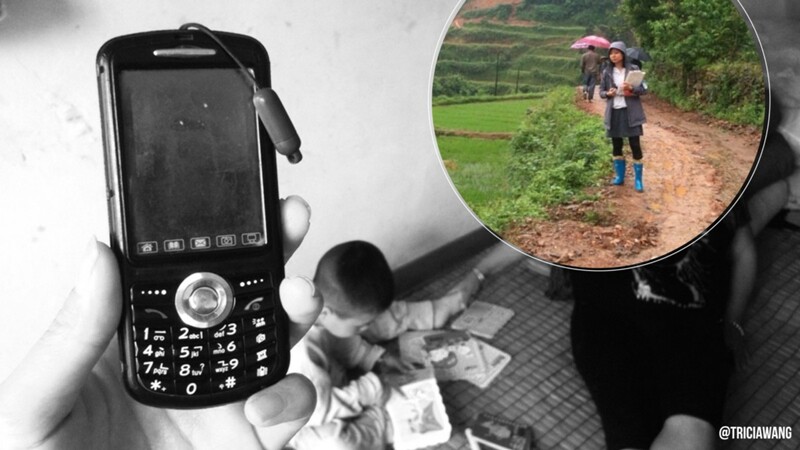 Why ethnography matters in a digital world. Editorial team’s favorites and most popular posts from ethnographymatters.net.